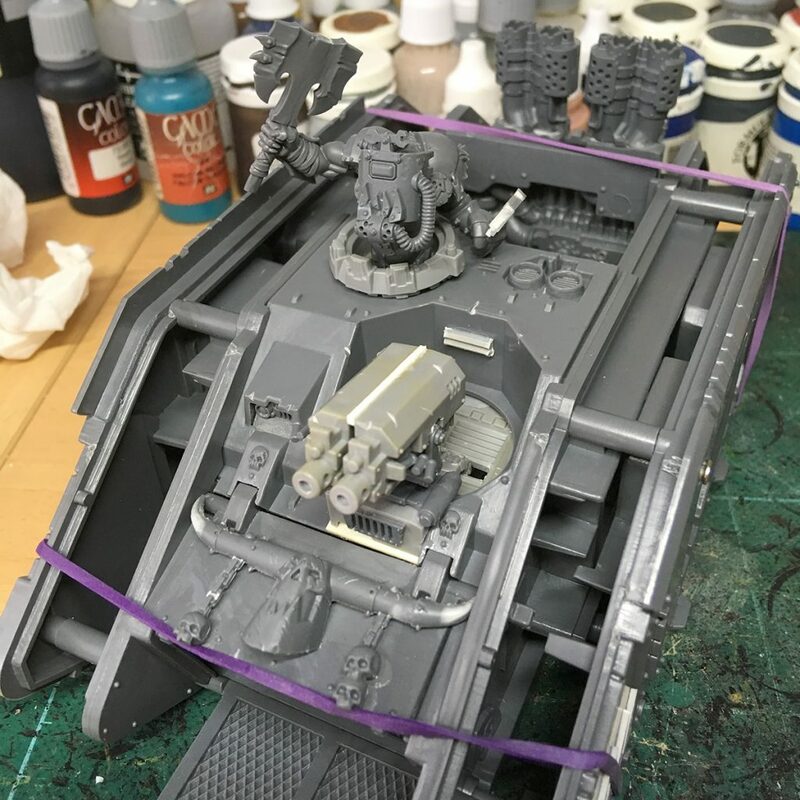 This is a review of the Sagittarius Conversion Kit from Blood and Skulls Industry. 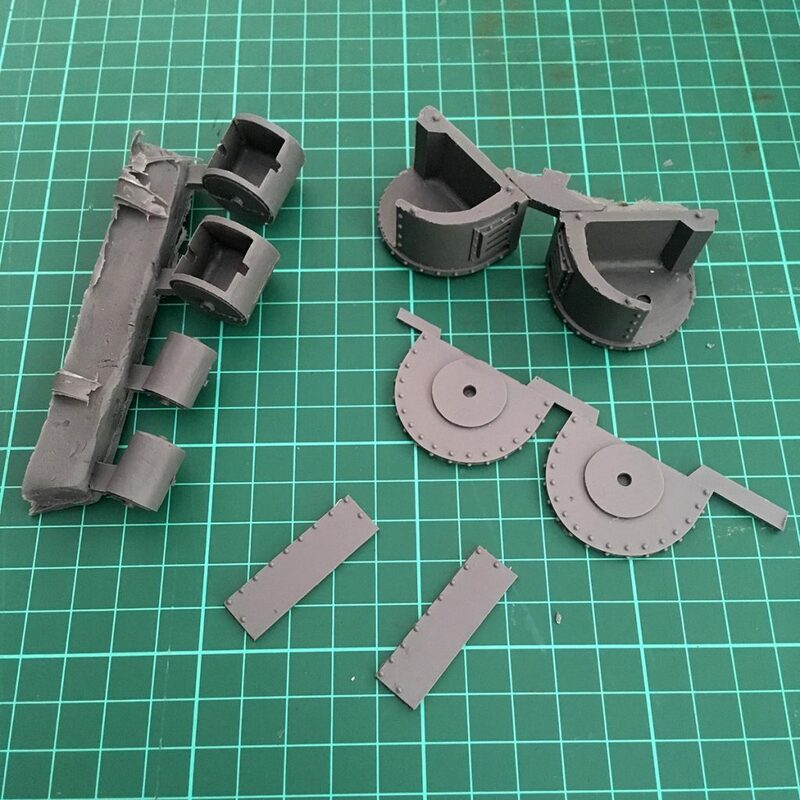 It’s designed to replace the tracks, track guards and upper hull from a plastic Land Raider. I’ve also chosen to add the Oppressor (spiky) tracks, and a pair of Alpha pattern dual-weapon sponsons. Here’s what the tank currently looks like, after assembling all the resin components. As mentioned in my previous post, the casting quality from Blood and Skulls is excellent. During assembly I found a few small air bubbles on the sides of some track links. There are plenty of spares though, and it’s also easy to position these so any bubbles aren’t visible. Overall, it’s a very good quality kit. Details on the Oppressor tracks is particularly good, with every last finger-piercing spike properly filled out. There was quite a lot of resin flash on the track sections, but this was simple enough to remove with a sharp knife. The resin is very hard, making details sturdier than Forgeworld resin. However, that means that it doesn’t sand very easily. There seemed to be a lot of mould release fluid on these, as I had very greasy hands after removing the parts from their packaging. I removed this by spraying all parts with Simple Green, and then scrubbing them under running water. Fairly standard practice for any resin kit, and it’s a good opportunity to inspect the parts closely before you glue them together. 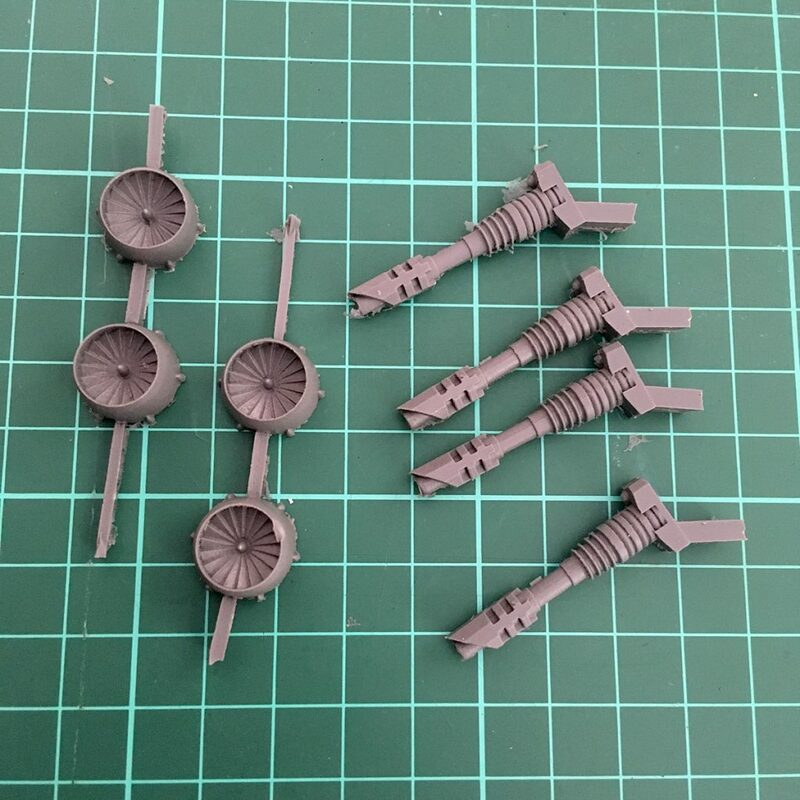 Blood and Skulls Industry produce excellent resin conversion parts, which I’ve used previously on my Imperial Guard. 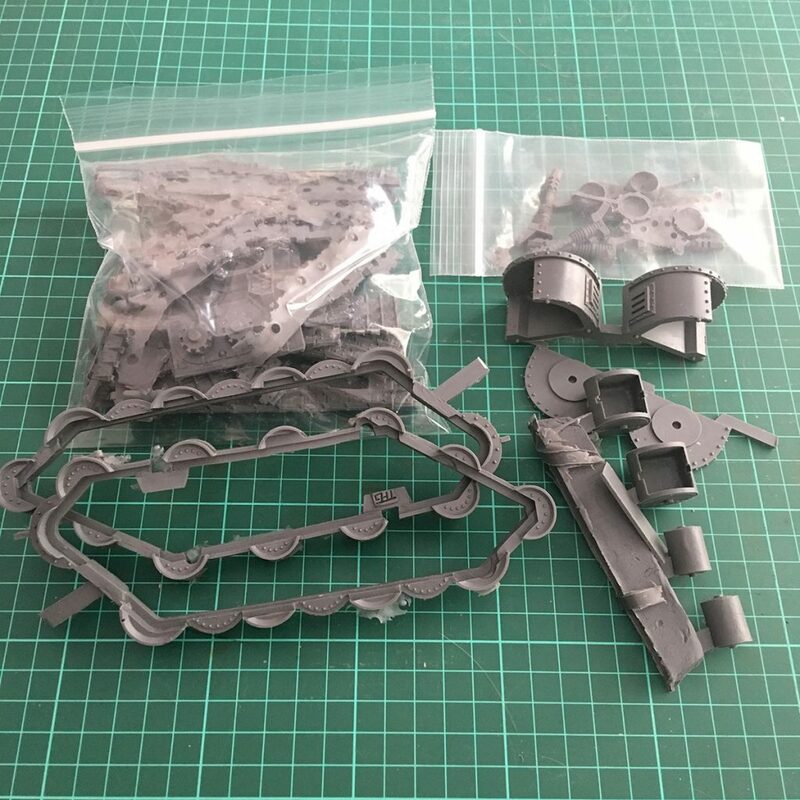 Today a package arrived with most of the parts needed to build the final two models for my Ork Custodes project. 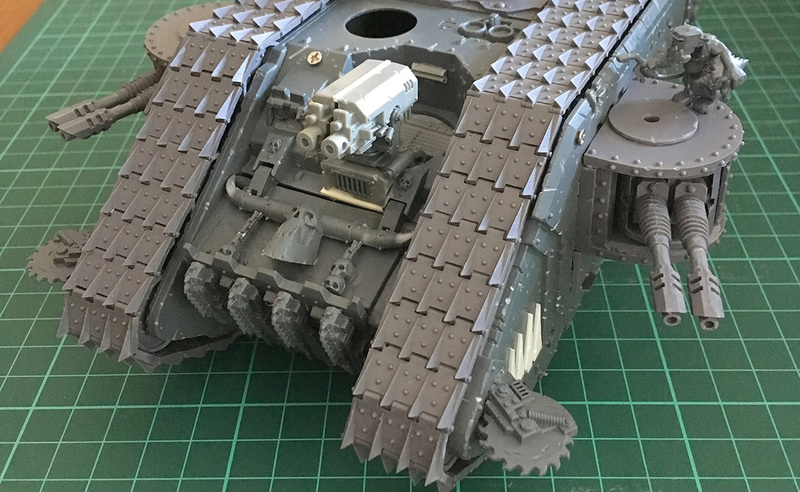 For the Venerable Land Raider, there’s a Sagittarius track conversion kit (with a set of spiky “Oppressor” tracks), some Alpha-pattern dual weapon sponsons, and four light Laser Cannons. There are also some small jet fans which I’ll use on a jetbike conversion. I’m excited about getting the tank fully assembled. The Ork Land Raider will be a huge centrepiece model for the army. Also, weighing in at a hefty 400 points it’s almost a third of my army points for Arc40k. It’s also a great opportunity to try using up as many of my remaining Ork model parts as possible. I’ve started with the mekboy welding mask, on an ‘Ardboy crewman doing his best “Drive me closer, I want to hit them with my axe” pose. Quite a lot of flash on the track links, but the detail is beautiful. Very clean castings, no air bubbles, and it seems a bit tougher than Forgeworld’s resin. It does all feel quite greasy to touch, though. I anticipate having to wash off a lot of mould release before assembly can begin on these. I like the slightly chunkier lines of the Blood and Skulls Industry weapons. The profile is still instantly recognisable to anyone familiar with Warhammer 40,000, but there’s a unique, slightly cruder aspect to the proportions. Not shown here: the handy magnet-sized holes in the back of the sponson weapon mounts. These match the holes in each of the weapons. 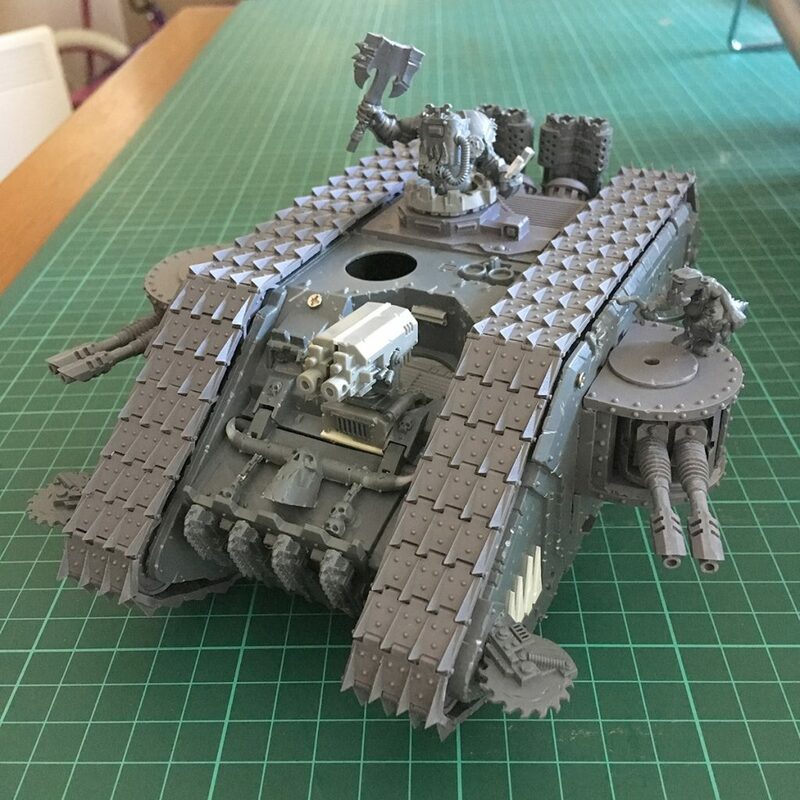 The Blood and Skulls kits are great on tanks like the Leman Russ, where you can easily magnetise a few different weapon options. In this case, I’ll glue them in place: a Custodes Land Raider always carries two twin-linked lascannon. Next time, I’ll cover how those enormous tracks are actually assembled. Then, I’ll try to finish off the Land Raider assembly before turning my attention towards the Shield-Captain’s jetbike.